Blog | May 2017 | How Much Energy Does a Solar Panel Produce? Homeowners shopping for solar often ask us: How much energy does a solar panel produce? It’s a good question because it will help you calculate how many solar panels you'll need to power your home. Depending upon its wattage, a single solar panel only makes enough electricity to power a light bulb for a few hours, but when you take a dozen or so high efficiency solar panels, you can power your whole household with clean energy from the sun. Because solar panels don’t work in isolation, it’s important to first understand a couple of key concepts: solar panel efficiency and how a photovoltaic (PV) solar system works. Solar panels capture the sun's photons -- little packets of energy – and turn them into electricity. To capture as much sunlight as possible you need an efficient solar panel. SunPower's X22 panel is the most efficient solar panel you can buy for your home. A SunPower® X22 panel converts 22.8 percent of the sunlight it receives into energy, compared to conventional panels that typically convert 15 percent to 18 percent. This means you can buy fewer SunPower panels to generate the same amount of power as a conventional solar system with more panels. Every PV solar panel is made of silicon, the same material used for semiconductors. When photons are collected by those silicon panels, they’re turned into direct current (or DC) electricity. That type of electricity is great for powering small gadgets like flashlights and phones. But homes are powered by alternating current, or AC electricity. So solar systems require an inverter to transform the DC electricity into AC to power your house. SunPower's panels are not just efficient because they capture more sunlight. They’re more efficient because they also have a smarter inverter setup. Let's say you have 24 panels on your roof. A traditional PV solar system strings together all of the energy that's captured from each panel and then sends it down to a central inverter, usually boxes mounted on the side of the house. The wires leading to the inverter usually connect the panels together, kind of like lights on a Christmas tree. But just like a string of Christmas lights, this arrangement can go on the fritz if one small thing goes wrong. For example, if shade from a nearby tree covers two of those 24 panels for an hour a day, the string will underperform. The problems in those two panels could keep the electricity generated from all of the panels from passing through the central inverter. The whole system becomes less efficient because of just two panels. SunPower came up with an innovative solution to this: the integrated SunPower Equinox™ system, which launched last year. It’s the only home solar system designed and built by one company to work together. The Equinox system has microinverters underneath each panel. So, each panel works independently instead of passing through one central string inverter. That means if shade hits two panels for a couple of hours, then just those two panels are affected. Plus, SunPower panels maintain their energy production much better than conventional panels in partly-shaded conditions. In a conventional solar panel, if a single cell is covered by a leaf or dirt, the panel could see a 33 percent reduction in power output. 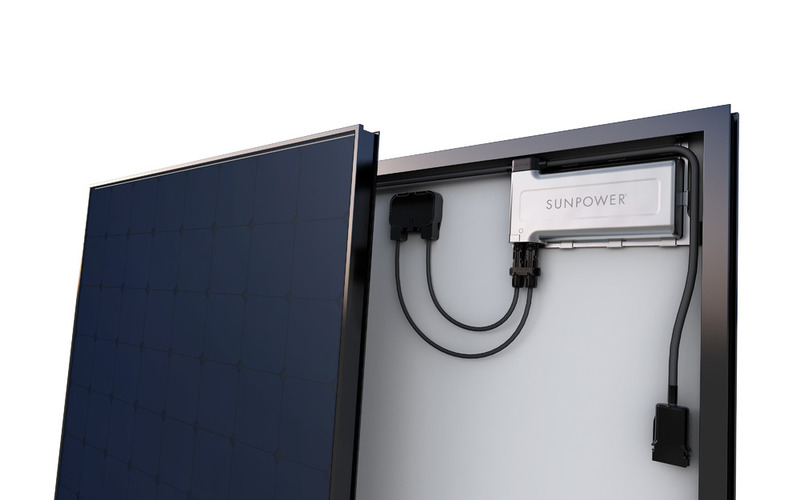 A SunPower X-Series panel might only see a 6 percent reduction in output. Of course, a lot of factors play into determining how many solar panels you'll need for your house. But you can get started by using our solar calculator. 1PVEvolution Labs "SunPower Shading Study," 2013. Compared to a Conventional Panel. 2 EnergySage Solar Marketplace Intel Report™, April 2017. 3 SunPower 360W compared to a Conventional Panel on same sized arrays (260W, 16% efficient, approx. 1.6 m2). 4 SunPower 360W compared to a Conventional Panel on same sized arrays (260W, 16% efficient, approx. 1.6 m2), 4% more energy per watt (based on PVSyst pan files), 0.75%/yr slower degradation (Campeau, Z. et al. "SunPower Module Degradation Rate," SunPower white paper, 2013. 5 "SunPower Module 40-Year Useful Life," SunPower white paper. 2013. Useful life is 99 out of 100 panels operating at more than 70% of rated power.